Minibar combine an authentic Americana sound with a British pop influence -- not really surprising for a band based in LA but originally from the UK. Desert After Rain is the band's first independently released album after years on various labels and marries influences such as Paul Weller and The Jayhawks to create an enduring, memorable album full of atmosphere and evocative lyrics. 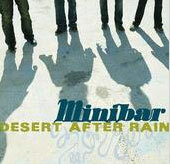 The concurrent tracks "Wide Open" and "Can I Call You a Cab" are probably the best examples of Minibar's craft on Desert After Rain, but songs such as the frenetic "Crime Scene Ribbon," the laid-back "Coming Home" and the dusky title track indicate the quality of the album as a whole. Minibar's members also sideline as Pete Yorn's touring band, but Desert After Rain proves that the band can take center stage themselves.